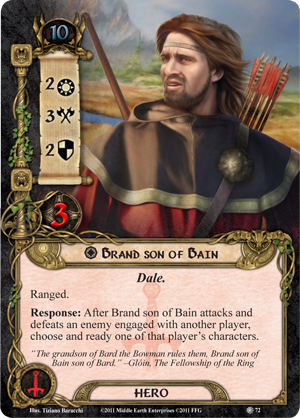 Brand Son of Bain: A Tactics Hero with a threat cost of 10. Will 2 Attack 3 Defense 2 Hit points 3. This character has the Ranged trait, which is probably its only saving grace. Brand is a pretty weak character. The ability never works in solo play and in multiplayer, cooperation in choosing heroes is paramount. If no one chooses a hero like Beravor, then Brand’s ability will trigger too late to be useful. In the future, there could be combos involving his ability, but right now, it is just not as good as what is out there. Song of Travel finishes off the basic set of songs that allow players to give any hero any resource in the game. Other than that, there are a couple of cards that could potentially have powerful combos, but otherwise, the cards in this set are almost yawn worthy. Gildor Inglorion and Keen-eyed Took could be combined in a deck to good use, but only if that deck works solely towards the sifting through the deck strategy. This quest has an interesting concept. The constant travelling to locations is easy to imagine. It really feels like a sightseeing tour of the hills. This is about all the quest offers though. The need to travel to gain victory points to win seems like a great concept for future quests, but here it is just boring. There is not enough stress or action. Players will either blow this quest away quickly or lose quickly from not being able to clear locations. This is probably the weakest quest thus far. It still feels more fun than, Hunt for Gollum, but mostly because it is over so quickly. If you are a completist, this pack is necessary. The quest is not that exciting and the hero is easy to pass up. There might be a couple of player cards that a player will miss, but most of them can be replaced by cards from other packs. If someone wants to run a Rohan deck, Ride to Ruin and The Riddermark’s Finest are staples and make this pack a worthy purchase. Add a Review for "The Hills of Emyn Muil Adventure Pack"